To everything there is a season. Autumn is my favorite time of year, but even as it is just beginning this year, I recognize that there will be limited time to enjoy it. Mom is moving. My 85-year old mother has purchased a new home and is downsizing to live all on one floor. This is an excellent choice for her, since she is still quite independent and healthy for her age and did not want the constraints of an apartment where she could not have taken her piano. Here’s the only drawback: my mother is moving at age 85. That means she really can’t handle the most physical of the work involved in the process. Honestly, at age 56, the process is not so easy for me anymore either. My mother is far from being a pack-rat, but anyone who lives in the same home for 22 years will have accumulated some amount of stuff. It’s the general stuff of life: things that were given as gifts, things that once served a purpose but won’t be needed in a smaller home with a smaller yard, and things that were decorative once and are now just in the way. But with extraordinary help from my sisters and sister-in-law we have managed to go through most of Mom’s stuff. Yesterday, Mom and I (with some much-needed and appreciated help from my husband) got most of the extra stuff ready for a garage sale, which will be held next weekend. Mom will get it all priced during the week and by Saturday morning we should be ready to just open the garage door and start selling. Anything that’s left will be donated to charity. At the same time, we are working to try to get some remodeling done in Mom’s “new” house. It’s very challenging to find a contractor on a tight deadline, and there are some projects we would like to have done quickly. Mom needs a first floor laundry closet installed, wants a bedroom closet door expanded, is planning a whole new kitchen, and wants a very poorly jerry-rigged rear entry problem solved. My sister who is an interior designer has been incredibly helpful with the kitchen layout and planning, and I am working on a plan for the back entry. Several contractors have been in for consultations, but the only way they can take it on right now is piece-meal, so we are prioritizing what will get done first, second, and third, and what must be done before mom moves in before Thanksgiving. So there you have it: a deadline is looming. Most of my lovely autumn weekends will be spent, at least in part, helping mom. We have some time set aside for parents’ weekend at our daughter’s college, and a couple of just for fun local events on the calendar. But mostly I am viewing this season as an investment in Mom. Other family members will definitely step in to assist and that’s great, but I know that Mom’s moving date will get here faster than we know, so even though my back hurts from hauling stuff around yesterday, this is really just the starting point. To everything there is a season. This fall will become a season of transition for Mom. For me, I will choose to call it a season of helpfulness, which is all I have to offer right now: some physical labor for painting, carrying boxes, and tearing out carpet; some mental capacity for space planning; and the slightest bit of talent for drafting primitive architectural plans. Today was a brief reprieve. While I should have been taking care of some house and yard work at home, the sunshine and remaining warm air were calling us too loudly. 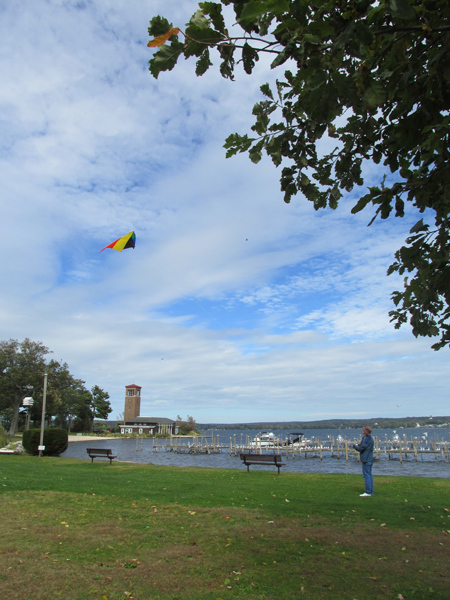 So we took a little drive to the lake, instead, and took a walk, took some photos, and flew a kite in the brisk, warm, breeze. And when we’re done getting Mom settled into her new place, I have a very strong urge to go through everything in our own home and get rid of almost all of it. Winter may become the season of purging, if my back can stand it. We’ll see how that works out.